Read offers what might be called a generous liberal account of the life of Vladimir Ulyanov — better known by one of his pseudonymns, Lenin. As others have pointed out, it is impossible to write an “objective” biography of Lenin. On the one hand, it could be said that objectivity is impossible under any circumstance, regardless of the biographical subject. But for Lenin, the problem of objectivity is more of a concern than ever. Read dismisses most of the official Soviet Lenin biographies as hopeless, ridiculous hagiography. He doesn’t bother to quote any of them to support that conclusion — as we will see, that problem recurs throughout the bio — but those Soviet-era biographies are available for free online and even quickly skimming them does reveal them as rank hagiography just as Read claims. On the other side of the spectrum, many English-language Lenin biographies written in the West are tainted by overt anti-communist ideology. Read repeatedly calls out Richard Pipes as one of the most biased writers on that front. Read notes how such writers have an axe to grind and are interested in little else than dragging Lenin through the mud, usually by seeking anything (no matter how tenuous) they can use to support a narrative of Lenin as an inhuman monster of epic proportions, with a willingness to take events and statements out of context and ignore countervailing evidence. Even Robert Service — Read says only positive things about his work — has been accused by many of anti-communist bias. On the question of political perspective, Read is most definitely looking at Lenin from a liberal perspective, and that shows in places. But the editorial comments from that political perspective don’t swallow the whole book. This is the only English-language Lenin bio that the independent leftist scholar (if still to the political right of the Bolsheviks) Lars Lih recommends in Lenin (Critical Lives). What Read does most admirably is to free up Lenin from what came later. This is to say he spends little time trying to explain the policies of the Soviet Union under Josef Stalin and other leaders through reference to Lenin’s statements and writings. He mostly avoids historical determinism and tries not to attribute posthumous events in the Soviet Union back to Lenin — a favorite tactic of anti-communist writers (even if those same writers wouldn’t think of saying that the practices of Andrew Jackson or Richard Nixon were the inevitable outcomes of the politics of Thomas Jefferson or James Madison). This is a traditional biography, in that it is organized chronologically and focuses on being a repository of factual circumstances about Lenin’s life from birth through death. 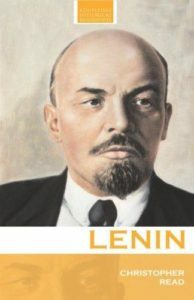 It is not primarily an account of Lenin’s political ideas, though some of those are introduced. Yet simply stating the facts of Lenin’s life in an accurate way is a challenge all by itself. After Lenin’s death — and directly contrary to his wishes — Stalin built up a cult of personality around Lenin and the Soviet government went so far as to retroactively distort historical facts to suit whatever official government position prevailed at a given time. Since the fall of the Soviet Union, the opening of previously secret Soviet archives has allowed for a much more complete and accurate biographic picture than would have been possible for much of the Twentieth Century. And yet, a large number of English-language biographies (like Richard Pipes’) have used the archives for nefarious purposes, such as scapegoating Lenin and taking his positions out of context, usually to try to blame Lenin for being some kind of “root cause” for the crimes of Stalin and others long after Lenin’s death. Read breezes through Lenin’s early life. He is clearly less interested in that period. Still, all the basic facts are there and Read doesn’t waste ink on pointless factoids. The middle period of Lenin’s life, spent mostly in exile, is where Read really shines. He does a good job condensing the period down without grave distortions, and manages to convey some feeling of what it was like to be there. Though readers wanting to gain an understanding of Lenin’s political objectives in this period should look elsewhere. Lars Lih‘s Lenin (Critical Lives) is a good choice as a follow-up — it is not a conventional biography but rather is a sketch of Lenin’s political ideas, with an emphasis on historically contextualizing them. Lih makes clear that Lenin’s political outlook was centered on the use of the “heroic” narrative, and leadership by example. Read’s book also includes a generous amount of information about Lenin’s relationship with his family, from the motivation that arose after his brother’s execution to the support that his mother and sisters gave him. In the last part of the book, from the February (1917) revolution through Lenin’s death, the book is a little skimpy. Read’s political biases are a bit more problematic here. Read is clearly opposed to most of Lenin’s mature political ideas, and can’t bring himself to discuss them in any sort of sympathetic way, that is to say, without a distasteful sneer. It is partly a problem of concision. Read simply does not allot enough space to the crucial revolutionary period from 1917 on to contextualize Lenin’s views and so instead resorts to conclusory, unsupported generalizations. Read’s book is understandably meant to be a compact and accessible biography, but readers should be warned that Lenin’s political views get short shrift in the last part of this book. There are other books that treat Lenin’s final years more fully. For instance, Moshe Lewin‘s Lenin’s Last Struggle is a short and readable summary of how Lenin fought against despotism during his last years, despite crippling health problems, and sought to block the rise of Stalin. Read clearly disagrees with that characterization, arguing that Lenin had only minor and mostly personal qualms with Stalin near the end of his life. Though in The Soviet Century Lewin notes that the opening of the Soviet archives added further support for the Lenin’s Last Struggle thesis and against Read’s position. In the introduction, Read states that he will mostly cite to Lenin’s own writings when possible. This later proves disappointing in that Read directly quotes Lenin rather sparingly, and more often relies on conclusory summaries (then again, more quotations would make this a much longer and very different book). This creates a problem compounded somewhat by the (unhelpful) tradition of historians of not using footnotes to precisely identify the support for each statement. For instance, Lenin famously argued (in The State and Revolution) against “bourgeois democracy” in favor of the Marxist concept of “smashing the [bourgeois] state” in order to rebuild it under the “dictatorship of the proletariat”, followed by a gradual “withering away of the state”. Read does nothing to contextualize or explain these points. He instead raises concern about Lenin’s critiques of (bourgeois) democracy. But many academics have studied the question and there is considerable evidence a hundred years later to empirically support Lenin’s theoretical position. C. Wright Mills is one, but also the liberal political scientists Martin Gilens & Benjamin Page recently showed (admittedly, after Read’s bio was published) that voting in the United States does not allow most people any significant influence on government policy, etc. In other words, there is empirical evidence that Lenin’s points about bourgeois democracy being a fraud are well taken — Read’s criticisms are therefore counterfactual and principally ideological. The book recounts Lenin’s public achievements as filtered through a liberal lens — only those that are palatable to liberal views are discussed as being actual achievements, while Marxist/proletariat objectives that oppose liberal views are mostly treated unsympathetically if not in an openly disdainful manner. For example, in the last part of the book, the crucial question of the Russian peasants and their central role in food shortages and famines is glossed over. This is a tremendous omission. Moreover, Read spends much time on Lenin’s period of exile, when he was endlessly arguing over matters of theory and party organization — precisely the sort of endless debate that is the centerpiece of Liberalism — while frowning upon Lenin’s period of revolutionary action toward the end of his life. And yet, Read does portray Lenin’s personal life as admirable. The portrait of a personal character ideally suited to the role of statesman and the most prominent philosopher king (Read’s term) of the Twentieth Century is wonderfully drawn. How many other world leaders published books on substantive political theory while in office? — during a civil war and simultaneously under foreign invasion no less! Read mentions that Lenin became angry when a bureaucrat gave him a modest raise. Though unmentioned are other details that would contextualize Lenin’s years in political office, such as how he mostly ate kasha (cream of wheat) and thin vegetable soup. A minor detail, yes, but also one that emphasizes how profoundly different Lenin was from just about any major political leader then or now. Another issue throughout the book regards Read’s occasional editorial comments. For instance, he concludes that Lenin’s refusal to compromise was a personality defect. He doesn’t really draw out that argument. It is offered as if it is self-evident. Yet one could easily have argued this was Lenin’s greatest virtue. Though really what Read implicitly means is that Lenin refused to compromise with bourgeois liberals, which is a sign that this is ultimately an unsympathetic biography. Lenin was arguably more willing than most world leaders to change his position; only he remained dedicated to the egalitarian principles of Marxism. He never succumbed to the liberal idea of endless debate to always put off the decisive bloody battle (to paraphrase Carl Schmitt‘s characterization of liberalism). Lenin argued for the need to take things to the end. In the neoliberal era (the period in which Read’s book was published), the essence of the dominant political ideology is destroying collective structures which may impede pure market logic. Surely no one would disagree that Lenin’s goal was precisely the opposite? Read may not be a full-fledged neoliberal, but he gravitates toward merely softening the ill effects of (neo)liberal ideology rather than resolving the underlying class-based contradictions the way Lenin advocated. On the other hand, it could be argued that Lenin made numerous compromises, many of which are documented in Read’s book: adoption of the Menshevik agrarian land reform program, the Treaty of Brest-Litovsk (surrender to Imperial Prussia), the New Economic Program (NEP), etc. Of course, all these represent strategic economic/political concessions to avoid compromises to liberal ideology. But aren’t liberals just as insistent on the absolutism of their own “process over substance” ideology? One of the most divisive aspects of Lenin’s political career is the seeming Machiavellian nature of much of it. Machiavelli’s work The Prince is often oversimplified as suggesting that “the ends justify the means”. But that is an unfair characterization, in that Machiavelli was really arguing that a particular end — the founding of a republic — justified engaging in means that would otherwise be unacceptable. Lenin deployed somewhat similar logic, but in a narrower way, namely, that eliminating class conflict to create a state based on egalitarian communist principles justified fighting back against class oppressors. Lenin was very clear that the bourgeoisie were already fighting a class war against the working class — they simply obscure, conceal and deny the harms they inflict on the poor and the proletariat. Some of that might today be termed “structural violence”. And yet, it can be said that Lenin wasn’t exactly Machiavellian, but rather followed the French revolutionary model laid out by the likes of Saint-Just: “Those who make revolutions resemble a first navigator, who has audacity alone as a guide.” He grounded his actions in only their own efficacy. Or it might be further said that “every authentic ethical position by definition paradoxically combines universalism with taking sides in the ongoing struggle.” Lenin wagered (accurately, in the case of Russia) that the ruling class would not voluntarily surrender any meaningful amount of power to the proletariat. This concept that, in the general sense, violence is necessary for radical emancipatory projects, predated Lenin. Far from being a hypocrite, Lenin simply discarded the liberal utopianism that avoids outright political struggle. It took the French revolution to institute the metric system, and the October revolution to move Russia to the same (Gregorian) calendar as most of the rest of the world. The belief that these seemingly “simple” things can be instituted merely through parliamentary debate is usually naive! This book certainly won’t be the last word on Lenin and his life. But, for English-language biographies, this keeps the anti-communist bias to a relative minimum, without getting past it entirely. Readers looking for a more sympathetic treatment of Lenin’s ideas and actions as a public figure should look, first and foremost, to the writings of Slavoj Žižek (Revolution at the Gates, various short articles, and Lenin 2017), but Lars Lih also provides useful historical context (Lih is ultimately opposed to many of Lenin’s political ideas, though less so than Read).